About a month ago, our 16-year-old Kenmore Elite HE3t washing machine had a little mental breakdown. It just refused to finish a cycle without having to be stopped and restarted multiple times. Since I have a life, and can’t babysit a washing machine all day, I did some online research to see how to resolve the issue. The washer was throwing an error that indicated an issue with the door latch. You may remember that we replaced the door latch a few years back. So, I ordered a new latch from Amazon ($65). The new door latch arrived and I happily installed it. The repair fixed the door latch error, but the washer continued to stop mid-cycle. This time, though, it was displaying an “fh” error. The “fh” error indicated a problem with the water supply, which could be due to one or more of about six parts. While troubleshooting, I found that if I pressed on the control board when the washer was stalled, that it would restart. Weird. So I decided to replace the control board, to the tune of $200. The control board arrived. Though I forgot to take photos, it was very easy to swap out the board. To access the control board, I removed the three screws that hold the top of the washer in place. I removed each of the wires from the control board, one at a time, labeling them with masking tape as I removed each one. The old control board popped out easily. I put the new board in, and reattached all the wires. I turned the power back on, reset the washer per the instructions on the control board installation sheet, and started an empty test wash. The washer made all the happy, clicky noises that it usually makes when a cycle starts, but then … no water. No water was coming into the washer. And then, beep … beep … beep. “fh” error. Back to the internet. So no water coming in could be: water inlet valve, pressure switch, leaking pressure switch hose, flowmeter, clogged pressure switch air trap, clogged drain pump trap. Okaaaay … here we go. Steve moved the washing machine out from the wall so that I could crawl behind it. I removed the back of the washer. You may remember that we replaced the water inlet valve a while back also, so I didn’t think that was the issue, but I figured we could take it off and clean it. It was pretty gooped up, but Steve cleaned it pretty thoroughly. We also removed the front lower panel of the washer and cleaned out the drain pump. We reinstalled the now-cleaner water inlet valve, but still the same issue. So I pulled out my ohmmeter to test the solenoids on the water inlet valve. First, I google “how to use an ohmmeter” – seriously, I own an ohmmeter but didn’t know how to use it. I tested the solenoids and they appeared to have “continuity”, which means they are working properly. So now I was kind of stumped. Since I didn’t know what needed to be fixed, it was hard to know what my next step should be. Plus, I had already spent about $275 and two weekends on this, and the washer was in worse shape than when I started. The whole situation was extremely disheartening. AND we had accumulated piles of laundry. I had scheduled a vacation day from work, so I used it to go to the laundromat. $40 to do all our laundry, and we didn’t even dry it! We took it home to dry. Meanwhile, I decided that maybe the pressure switch air trap was clogged. Apparently, if this trap is clogged, the washer cannot detect the water level, and may refuse to fill. So I removed the back of the washer, again, and squeezed behind the washer, again. 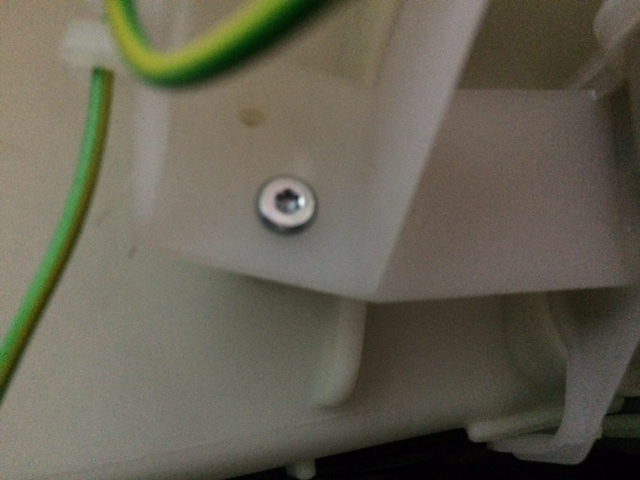 I found the pressure switch air trap, which was secured by a single hex screw. There were some wires running by the trap. I’m not sure what they do, but I carefully removed them. I pulled out the trap, which was completely gooped up. I climbed out from behind the washer, cleaned the trap, then reinstalled it. Replaced the back of the washer, which is attached by 4.7 million screws. Not really, obviously – there are only about 14, but it felt like 4.7 million to my back. Turned the washer back on. No water. Beep … beep … beep. “fh”. $#*&%^@#&!!! At this point, I figured I would just replace everything that I could afford. The flowmeter was the most expensive so I opted to wait on that. I went to Amazon and purchased a new water inlet valve ($25), a pressure switch hose ($7), and a pressure switch ($30). All I can say is thank goodness that Kenmore made a billion of these washers, because parts, and online help, are still widely available. The parts trickled in over the course of a week. Yesterday, I gathered up all the parts and my tools, took off the top of the washer, disconnected the water supply lines, took off the back of the washer, and slithered behind it to start my repairs. I pulled the pressure hose off the pressure switch air trap, and attached one end of the new one. I clipped the new one in its place in the clip inside the washer cabinet. 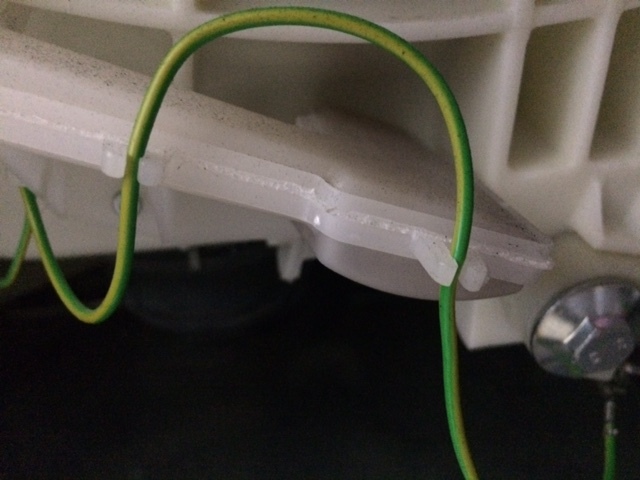 Then, I removed the wire plug from the pressure switch, and pulled the switch out, carefully. I put the new switch in, attached the other end of the new hose to it, then reattached the wire plug. Next, I removed the screw that holds the water inlet valve in place. I removed solenoid plugs and the downstream hose from the inlet value. I attached the downstream hose to the new valve and slid it into place. The screw holes did not line up on the new part. After some wiggling, and some damage to my hand, I was able to get it into place. I reattached the water supply lines, taking note of the fact that the cold water line seems to be slightly damaged (hmmm). Then I replaced the solenoids plugs. I replaced the rear panel of the washer, and climbed out from behind the it. I turned the power and water back on, and tested the washer. No water. Beep … beep … beep. “fh”. I came very close to bursting into tears. We really can’t afford a new washer right now, and I didn’t know what else to try to fix. Plus, I had already poured close to $350 dollars into repairs, and we had been without a washer for three weeks. I took a shower and then sulked on the couch, eating mozzarella sticks. I didn’t sleep well at all last night. I am still have issues with my lower back, and clamoring around behind the washer did NOT help. I thought that maybe I could manually fill the washer with water, let it agitate, then drain, add fresh water to rinse, etc., and in this way, maybe get a load of underwear cleaned. I checked the washer by starting a cycle, just to see if it would agitate. To my enormous amazement, it began to fill with water! I ran an empty cycle, and it completed. Then, I did a wash of all the towels that I had used to mop up water during the repairs, and it completed with no problems. I am doing a second wash now. I stopped mid-cycle, but I was able to restart it. When it stopped, it was still throwing the “fh” water supply error. I am stumped by why this error continues, but at least we can do laundry again now. I ordered new water supply lines, since the existing ones are slightly damaged, so maybe that will help the issue. If we can limp it along, in a couple of months, we will be in a better position to purchase a new washer. Maybe if I talk to our existing washer in a supportive manner, it will continue to work properly. Please send your best thoughts and wishes for its continuing recovery!